Summer has finally arrived, and with warm sunny days often come the holidays! Many of us are planning trips and getaways, and to me preparation is half the fun. I like to come up with a list of things to do/see and plan a route to optimize my time, even though I usually end up wandering around without purpose, simply enjoying the moment. Packing is also something I enjoy very much – I make it a personal challenge to bring only the essentials and to travel light. 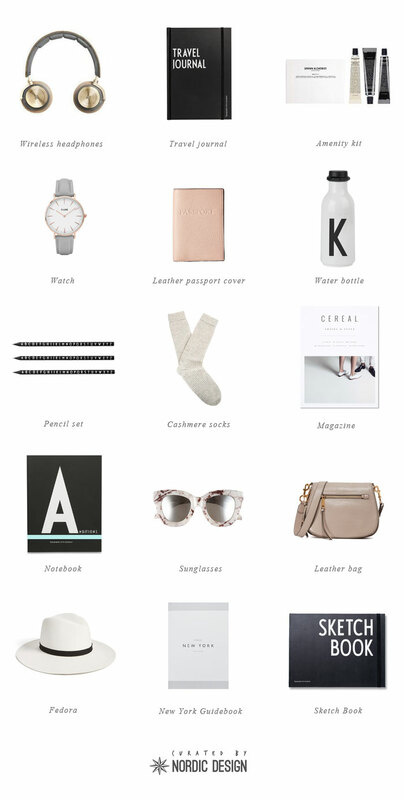 Each trip, I curate and edit the content of my bag with stuff I’ll definitely need and enjoy. What do you always bring along on holidays? Disclaimer: This post was made in collaboration with Design Letters. We only work with brands we use, love and recommend, and all thoughts and opinions are our own. Our partners contribute to the growth of Nordic Design, and we thank you for supporting them. Love this selection! I always bring headphones, my extra battery for my phone (because I take too many photos), sunglasses and comfy shoes for all the walking..